Inspired by the playful spirit of dancing raindrops and the daring spontaneity of a storm, the Birks Splash collection brings together unquestionable beauty and flawless charm. 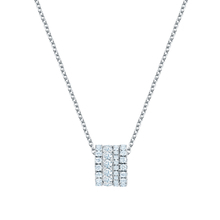 The epitome of high impact glamour, this Birks Splash Roll Pendant boasts rows of glistening diamonds with a total carat weight of 1.01, set within an 18ct white gold roll pendant and presented on an 18-inch white gold chain. Whether you wear this piece as a stand-alone focal point or team it with the Birks Splash Huggies in 18ct White Gold for added impact, you’re sure to make a lasting impression, wherever you go.